Paron Fabrics is leaving its W. 40th Street location for a spot on W. 39th. Paron's is getting ready to pack up and move to their new location at 257 W. 39th Street (across from Dakota Braids & Trims), and all fabric has been reduced. Everything in the main room is 30 percent off, and everything in the Annex is 60 percent off. You can tell they haven't added any new inventory in awhile, and the pickings in the Annex are really slim, but I was able to grab the last 2.5 yards of a patterned wool I first coveted months ago, now 30 percent cheaper. Store employees tell me Paron's will open in its new location around the beginning of February, and that this week is the last week they'll be open at W. 40th. I'm looking forward to visiting the new location, and fingers crossed that they keep the Annex. Current Kwik Sew and Burda patterns are not on sale, but you can find out-of-print Vogue, Butterick and Burda patterns for $2 each in the Annex. B&J Fabrics' new online store says Navajo prints are hot. It will probably take forever, but one by one the stores of the Garment District are catching up with the rest of the world by adding online shops. B&J Fabrics recently beefed up its online shopping site about a month ago, and while you can tell that tweaking still needs to be done (there's no way to judge the size of a print motif or the drape of a fabric, for example), I think they're clearly heading in the right direction. The fabrics B&J has on its online site are a decent representation of what's available in the store. What's really attractive about shopping online at B&J is the "free ground shipping on all domestic orders, and $50 Priority FedEx shipping on all international orders." Nice! Other NYC Garment District fabric stores with online retail sites include Mood Fabrics, Elliott Berman Textiles and Paron Fabrics (Manhattan Fabrics online). I wish NY Elegant and Rosen & Chadick would join the others and venture online too. My online fabric buying experience is very limited, because why shop online when I can walk a block and buy fabric in real life, right? But do tell me about your online fabric shopping. Have you ever bought fabric from a Garment District store's online site? How would you rate the experience? 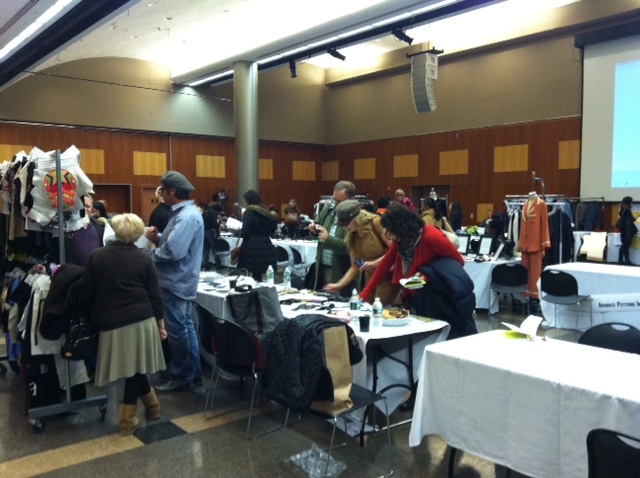 On Tuesday FIT, the Garment Industry Development Corporation and the Fashion Center hosted the first annual City Source, a Garment District supplier showcase. I checked it out on my lunch hour and was glad I came: The resources available in NYC's Garment District are just amazing. If you are an emerging designer and you missed this event, well, shame on you and don't miss it next year. It was a great opportunity to research and build contacts with sample and patternmakers, embroiderers, pleating companies, digital printers and more. About fifty vendors filled FIT's Great Hall. Digital printing and CAD studio LTS Design. That pink-and-green print in the back just screams Beach Tunic 2012 to me. Gorgeous beading and embroidery by New York Embroidery Studio. The way to make a simple sheath dress look like a million bucks. Why Not Sew a Winter Coat for Your Dog? If you read this blog with any regularity, you know I'm a big proponent of sewing your own winter coat. Why not make one for your beloved pet too? My dog has a Lands End fleece coat but it's just not heavy enough for the bitter cold we experienced in NYC this week. So I ordered this pattern yesterday from McCalls and am thinking about what fabrics to use to get the right amount of warmth for my Ralph. Probably some quilted nylon from A.K. Fabrics, possibly some neoprene fleece I bought two years ago from Mood Fabrics, maybe a little tweed for British style? (When I put Ralph's coat on him for a walk my husband always tells him the other dogs will beat him up for looking less than macho, but we just ignore him.) Pacific Trimming has loads of reflective trim in all sizes and colors, which is especially important for walks after dark. Have you ever made a dog coat before? Any suggestions for me and other dog-loving STGD readers are greatly appreciated. Stay warm! My colleague Marianne's dog Duchess wearing the fabulous coat that talented New Zealand sewer Christine Thompson custom made out of red leather and a sporty plaid lining. Christine is Marianne's aunt and this coat was a wedding gift for Marianne and her new husband. 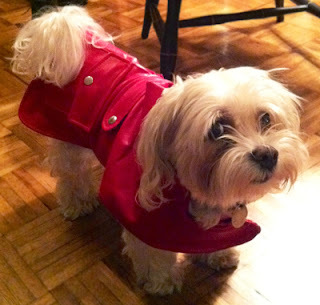 When Duchess wears this coat all the other fashionista dogs in NYC are so jealous of her! Tuesday, January 10, 2012, 10 a.m. to 5 p.m. FIT and the Garment Industry Development Corporation are proud to host 50 locally based factories and suppliers who will showcase their work, including pleating, embroidery, sample and pattern making, printers, production, marking and grading, wovens, accessories, knits, small lots, tailoring, and quick turns. Click here to register for the event, which is open to "designers, retailers, students and fashionistas." This sounds like a great way to experience all the fabulous resources the Garment District has to offer—meaning the ones that aren't readily apparent to those of us who tend to dwell on the street level. I have this event on my calendar. Hope to see you there!